Home Styles Biscayne 5-Piece Set includes 42-inch Round Outdoor Dining Table and Four Swivel Chairs. Set is constructed of cast aluminum with a White finish. Features include powder coat finish sealed with a clear coat to protect finish, attractively patterned table top has center opening to accommodate umbrellas, and nylon glides on all legs. Table Size: 42w 42d 30h Chair Size: 24.4w 22d 33.46h. Seat height 16h. Stainless steel hardware. 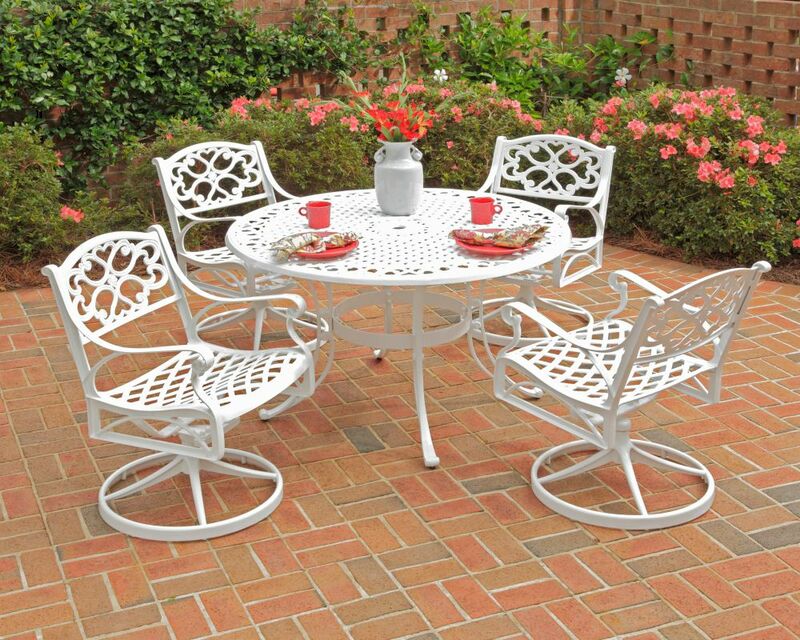 Biscayne 5-Piece Patio Dining Set with 42-inch White Table and Four Swivel Chairs Home Styles Biscayne 5-Piece Set includes 42-inch Round Outdoor Dining Table and Four Swivel Chairs. Set is constructed of cast aluminum with a White finish. Features include powder coat finish sealed with a clear coat to protect finish, attractively patterned table top has center opening to accommodate umbrellas, and nylon glides on all legs. Table Size: 42w 42d 30h Chair Size: 24.4w 22d 33.46h. Seat height 16h. Stainless steel hardware.